Jockey Florent Geroux celebrates after winning the Clark Handicap aboard Leofric. 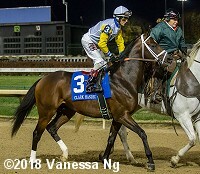 The feature race on Thanksgiving Friday at Churchill Downs was the $500,000 Clark Handicap presented by Norton Healthcare (G1), a 1 1/8 mile test over the main track for older horses. 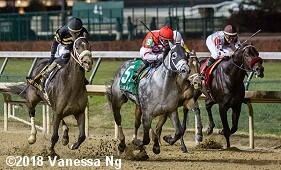 Conditions were typical for Louisville in late November, with overcast skies and temperatures in the mid 50's, with the main track rated fast and the Matt Winn turf course yielding. Ack Ack Stakes (G3) winner Seeking the Soul was sent off as the 3-2 favorite in the field of 8 exiting his 2nd place finish in the Breeders' Cup Dirt Mile (G1). 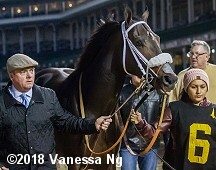 In to challenge him included 5-2 second choice Bravazo, runner-up in the Preakness (G1) and Haskell (G1) and 3rd in the Breeders' Cup Dirt Mile (G1) last out, and 3-1 third choice Leofric, winner of the Fayette (G1) at Keeneland after finishing third in the Woodward (G1). Down the stretch with Leofric out front. Jockey Kent Desormeaux sent 11-2 fourth choice Prime Attraction to the lead first time by and he set fractions of 23.56, 47.58, and 1:11.61 while pressed by 66-1 longest shot Sightforsoreeyes and 40-1 Storm Advisory. On the far turn the pacesetters tired as Leofric, 4th early under Florent Geroux, came out 3 wide for room and swept to the front through 1 mile in 1:36.14. Bravazo, 5th early under Joel Rosario, put in a strong late rally but Leofric held him off in the final strides to win by a neck in 1:48.59 over the fast main track. It was another 2 3/4 lengths back to late-running favorite Seeking the Soul third. 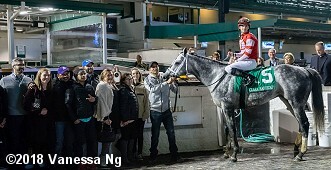 Leofric in the winner's circle. Winning trainer Brad Cox said, "Florent did a great job. He ran really well after running most of the summer and not missing a beat. He ran hard in the Fayette and I was a little concerned he may be coming back a bit too quick. He had two really nice breezes over the track and came into today's race ready to go. Mr. (owner Steve) Landers has been very patient with this horse. We'll maybe look at the Oaklawn Handicap or something like that down the road. We'll see how he comes out of things. I'm really proud of his effort. He's really turned the corner over the summer and become a top-quality horse." Right: Leofric heads back to the barn. 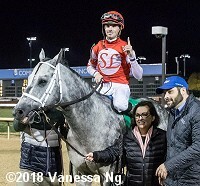 Winning jockey Florent Geroux said, "We had a great trip in the pocket the entire way around. That made the difference. This is a really nice horse. He's had some great preparation by Brad (Cox) and his team before this race. He fought Bravazo the whole way until the wire. I'm so proud of his effort. He had a really tough beat in the Oaklawn Handicap and then got hurt and took some time off. He had a great summer of preparation for this start." Left: Second place finisher Bravazo walks over before the race. 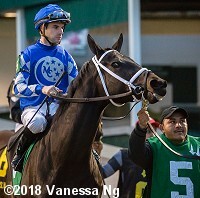 Jockey Joel Rosario said, "I'm so proud of his effort. He ran really hard today. 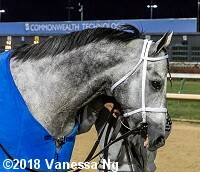 We had a great trip just off of the pace and I tipped him towards the outside around the three-eighths pole and he started to pick off horses. He tried the entire way down the lane and we almost got the job done." Right: Third place finisher and beaten favorite Seeking the Soul in the post parade. Trainer Dallas Stewart added, "Johnny (Velazquez) said he just ran kind of even around there. Just a bummer." The field of 8 breaks from the gate for the Clark Handicap. John Velazquez aboard favorite and eventual 3rd place finisher Seeking the Soul (3) said, "He was in a good spot early around the first turn. He just gave kind of an even effort. I split horses around the quarter pole but he just kind of flattened out." 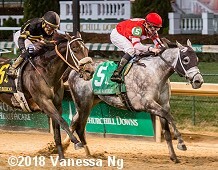 Immediately before the Clark, a field of 10 three-year-old fillies went to post in the $200,000 Mrs. Revere Stakes (G2), a 1 1/16 mile trip over two turns of the Matt Winn Turf Course. Premio Regina Elena (G3) 3rd place finisher Stella di Camelot was sent off as the prohibitive 1-2 favorite off wins in the Prix Nubienne at Maisons-Laffitte and the Pebbles Stakes at Belmont Park. 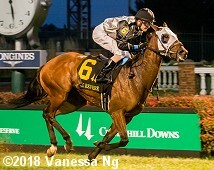 In to challenge her included 5-1 second choice Cool Beans, 3rd in the Valley View (G3) at Keeneland after finishing 2nd in the Hatoof at Arlington, and 17-2 third choice Get Explicit, 2nd in both the Flaming Page at Woodbine and the Valley View (G3). 115-1 longest shot Arabella Bella and Cool Beans dueled for the early lead for the first half mile through fractions of 24.42 and 50.01 over the yielding course while stalked by Stella di Camelot and 9-1 Angel of Mischief. Approaching the far turn Arabella Bella tired badly as Cool Beans continued to lead through 3/4 in 1:15.83. Entering the stretch Cool Beans opened up a 1 1/2 length advantage through 1 mile in 1:41.19, but 11-1 Princess Warrior, 6th early under Brian Hernandez Jr., swept to the front 4 wide and was all out to hold off late-running Get Explicit by a length in 1:47.61. It was another 2 lengths back to Cool Beans third, while favorite Stella di Camelot checked in 5th. 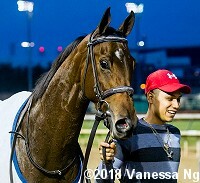 Left: Princess Warrior in the winner's circle. Winning trainer Ken McPeek said, "We took her off the dirt and her form fell off really bad. I thought she may have just been in heat and dealing with some female problems. She's a lighter type of filly and has really handled the grass well. I'm thrilled that my great friends Dr. (Hiram) Polk and Dr. (David) Richardson (breeders and owners of Mrs. Revere) are here to present the trophy. I hope this race can get us an invite to the American Oaks (at Santa Anita)." Right: Princess Warrior heads back to the barn after the race. Winning jockey Brian Hernandez Jr. said, "Coming from the (Queen Elizabeth II Cup [G1] at Keeneland, finished 4th) really benefited her today. 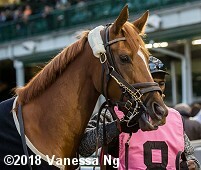 I saw Chad (Brown)'s filly (Stella di Camelot) was a bit aggressive passing the wire for the first time and I knew going into the race she was the one to beat. I tucked in behind her and when we turned for home she really responded well to me. I think the Queen Elizabeth gave her a lot of confidence for this start today." Left: Second place finisher Get Explicit walks over before the race. Jockey Ricardo Santana Jr. said, "My filly ran really big this afternoon. We couldn't quite get to the winner down the lane but I'm really proud of her effort. She dug in and tried the entire trip." Right: Third place finisher Cool Beans heads out for the post parade. Jockey Florent Geroux said, "We were pressured early on but she settled nicely. She just didn't have enough in the final eighth mile." Fifth place finisher and beaten favorite Stella di Camelot walks over before the race. Jockey Joel Rosario said, "It was a tough post position. I tried to get her over early from that far outside but we were pretty up against it. She just didn't have enough in the final stretch."